How fast can you make your Banoffee Pie with some crushed digestive biscuits and our super-speedy caramel? There’s no cooking involved, only a bit of melting, and with only six ingredients it’s easy to whip up at short notice. Whether you make it for a family dessert or a special occasion, this quick Banoffee Pie is sure to go down a treat. 1. Put the crushed biscuit into a bowl with the melted butter. Mix it together thoroughly, then press the mixture into the base and sides of the tin. Chill for 30 minutes. 2. Spread the caramel over the base. Just spread it out with a spoon or a spatula – there’s no need to beat. 3. Slice the bananas and scatter them over the top, then put the cream on top and decorate with grated chocolate. Chill until ready to serve. In a hurry? Put the base in step 1 in the freezer for 10 minutes instead of the fridge. Or for an even easier option buy a readymade sweet pastry case instead of making the biscuit base. Hi Christine, what a fab idea - sounds delicious! Just made this for the first time and it turned out a treat and my son loves it. One note for next time though. My biscuit base was stuck firmly to the tin so I will use parchment paper on the bottom. I have frozen a small piece to how it freezes. Does this one taste just as good as the classic recipe? Thanks! Hi Francesca, we certainly think so! The Quick Banoffee Pie recipe has a slightly silkier, creamy tasting caramel when compared with the classic recipe, which has a thicker set. Made this ,very easy BUT the consistency was way too runny, the Caramel oozed out all over the plate, it was a disaster ! Didn't look good at the barbecue ! Hi Sarah, sorry to that your banoffee pie is misbehaving! Try not to work the Carnation Caramel to much whilst making the Banoffee. The more the Caramel is worked the softer it will become. I've made this a few times and turns out superb every time! Hello Lynne, it is always wonderful to hear of Banoffee pie successes. Hello Tracey, this recipe is always a hit. A top tip for perfect banoffee is to simply spoon the caramel directly from the tin onto the biscuit base without stirring. This will ensure a set that can be cut cleanly. Put caramel and base in freezer for 10 mins to set. Then don't need to leave for an hour in fridge. Brill recipe. Love it! Hi Laura, we love to hear top tips! Hi can you freeze this please? Hello Carol, we have not tried freezing this recipe. If you want to try freezing then make sure you do it before adding the bananas and the cream. The simplest never-fail recipe! Added some mangoes with bananas (as we only had 3 bananas left and the recipe called for 4) and it was absolutely delicious! Top tip with the caramel indeed reaps top squidgy caramel. Thank you Carnation! I've made this a few times and once with a group of children. Really goes down well! I use double cream instead of whipping cream and i add a little bit of sifted icing sugar to the cream before whipping. Quite a lot of calories, but once in a while it's OK! Can you make the base and add the caramel then freeze adding banannas and cream when you've defrosted ? Hello Linda, we have not tried freezing this recipe. If you want to try freezing then make sure you do it before adding the bananas as your comment suggests. Hello, is it best to buy the caramel in a tin or buy the tins you can cook?? Hello Anya, we do not recommend boiling the tins on Carnation Condensed Milk as bursting may occur. Our Carnation Caramel has been precooked to ensure even caramel every time. Where do you buy carnation caramel from im not sure if they have that product in New Zealand ??? Well ive never heard of it. Hello Lavinia, if you are looking for a product in New Zealand for this recipe then try the Nestle Highlander Caramel. This is one of my total faves. My kiddies love it and I love it. Oh my God... This is super easy and sooo delicious! Not good for diabetics though! This recipe is AMAZING!!! I've tried other recipes for banoffee pie that require the condensed milk to be boiled for 3 hours in water (and left me with runny toffee)! Not only is this faster, the toffee turned out much nicer. The only thing is you need to stir over heat for about 10 minutes to get thick toffee- not only 1 like the recipe states. This is so easy to do and I also found it was as good and even easier using a ready made sweet pastry base. I also found that using the carnation tin of caramel was even easy and super tasty! Hello, is it ok to use salted butter for the base? Hi Negar, salted butter will work just as well as unsalted. Hi I was going to make the crumbs and Carmel filling the day before . Can I leave it in fridge over night and can I add the rest of ingredients the next day ? Hi Geraldine, if you are trying to save time on the day then this is the best way to do it. The bananas and cream will be better and fresher if they are done on the day but the rest of this wonderful treat can be some ahead of time. Just make sure its kept in the fridge. made this today and it was gorgeous, the whole family loved it! How long do you boil the Carmel for? Hi Brenda, no boiling necessary! The beauty of Carnation Caramel is that we have done the boiling for you, just open the tin and spread. It's that easy! This pudding is a family favourite and as I'm a slight chocoholic I used chocolate Bourbon biscuits for the base with 50g of chopped up chocolate in it too. Very good dessert that everyone loves!! Hi I made this quick banoffee pie yesterday but the caramel went runny, I only spooned it on biscuit base, no beating at all, used a spoon to smooth it out. What did I do wrong? Hi Claire, there's very little that you can do wrong with a Quick Banoffee Pie, next time try chilling the pie for a couple of hours. 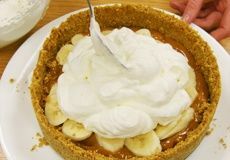 My banoffee pies always become runny , as bananas release moisture and this also makes the toffee run allover the place. Please can you advice what I am doing wrong? Thanks! Hi Monisha,try not to work the Carnation Caramel to much whilst making the Banoffee. The more the Caramel is worked the softer it will become. Hi can you make one of these without whipped cream? If so what do you suggest? Hi Kerry, the creamy topping in this recipe ties all the amazing flavours together. Try reducing the amount if you want to reduce the calories. I made this for the first time and got it spot on ..it went down a treat with everyone .. Loved it !! We always make the Quick Banoffee Pie it tastes amazing. Is it possible though to boil the Carnation Caramel to make it the same thick consistency as if we had made it with Carnation Condensed Milk and Sugar? Hi Craig, we do not recommend that you boil any of the Carnation cans. The beauty of Carnation Caramel is that we have already done the boiling for you! We make our Caramel by boiling the Carnation Condensed milk cans for you. Much safer! Opened a can of carnation caramel to put on the base of my banoffee pie and the phone rang so i put it in the fridge and it set...! So i ate it with a t-spoon right from the tin..! WOW YOU GUYS that stuff is lovely all on it's own..! Need to go shopping now to get another one to finish my banoffee pie..
A super easy recipe that tastes fantastic!!!! My teenage daughter was able to make without help! What a result!! I made millionaire SQuares using carnation caramel. I poured the caramel directly into the cooled base (no over beating) & the caramel never set & was a big runny mess?? Can u tell me the error of my ways?. Hi Aine, Carnation Caramel is a lovely creamy caramel but has a softer set than is needed for the Millionaires Shortbread squares. For this recipe you need a fudge texture that you get from cooking Carnation Condensed Milk, sugar and butter together. It's a little more work but totally worth the effort. Can I whip the cream a day in advance and add to the base, or should it be done just before serving? Not sure if it will ruin before I get it to the destination I'm taking it too. Also do I need to line the cake tin base to make it easier to remove from base of tin? Hi Diane, it is a good idea to line the base! We always try to whip the cream as freshly as possible for the best result. Made this and it turned out almost perfect however the double cream didn't seem to set. It seemed just a little too runny .. How do I fix this? Hi C-J make sure you beat the cream till it is stiff enough to hold peaks once its been in the fridge for a couple of hours it should be firm enough to serve. Just made this today soo easy and the best dessert ever !! Can you use the Anchor light squirty cream instead of whipping cream....what would the difference be? Hi Gil, Tip Top Squirty cream and other variations of this product produce a lovely light whipped cream however it will not hold as long as freshly whipped cream. hi all i made it and it taste great however i did find that you need to leave it to set a little longer then stated other than that it was delicious and now im full and ready to try another recipe! Hi Fallon, the beauty of carnation caramel is that we’ve done the boiling for you, it’s ready to use! Your 24cm loose tine will work just fine. I have made this a few times now and it is delicious. I found I needed to boil the caramel for a few minutes longer than stated. hi, I made this for my mum and she absolutely loved it, so did I !! Love this banoffee pie! However, I followed this recipe and unfortunately didn't look on the Carnation Caramel tin which said "Do not over beat the caramel as it will be too runny"! It didn't state that on here so I did overbeat which resulted in a runny middle. Carnation- please write this on this recipe! Hi Amy, a spring form tin works perfectly. 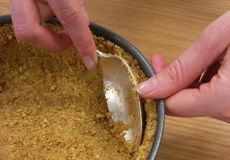 Just make sure you bring the crumbs up the sides to an even depth and then chill for 10min. Enjoy! Hi Georgina, that's one we're going to have to try! I've been making this for years - long before you could buy 'Carnation Caramel' (In those days you'd have to boil the tin of Carnation for an hour first). This recipe is so easy and now so much quicker. It is heavenly! The flavours and textures compliment each other perfectly. 10/10! Hi Claire, this recipe relies on the acid from the lemon reacting with the dairy products to create a luxuiously soft setting cheesecake. For best results mix together gently with a spoon. If this happens again try adding extra lemon and chilling for 2 hours. can you use caster sugar insted of using brown sugar when makin caramel?? Hi Vicki, yes you can but you will need to boil the mixture for about 3-4 minutes instead, also the flavour and colour will be less toffee like but still delicous! Would you please show the recipe with regular measurements such as cups, ozs etc? Thank you! Hi Zara, all biscuits vary a little so it sounds like there wasn't quite enough butter mixed in to the base - this is what sets it. Try adding another 20-30g of melted butter next time this should fix it! Hi I was wondering were I could find the caramel I look in all of the supermarkets but non sell any ? Hi Victoria, you should be able to find it in larger supermarkets next to the condenesed milk. Or you can buy it online with most supermarket retailers. I want to make this to take to my cousins. Will the bananas go really brown if I make it the night before? & also can I use fresh whipping cream? Hi Fowzia, if you make sure the banana slices are covered in the cream it should be ok- also you could try tossing the banana slices in a little lemon juice which helps to keep them from browning too. Yes fresh whipping cream is the best for this recipe. how long does this last or does it need eating straight away? Well Louise it never hangs about long in the Carnation Kitchen! But it will keep ok for up to 3 days - however the bananas will go brown after a day or so and the biscuit base will soften slightly when left in the fridge. If you like you could always make smaller versions as per our Light banoffee pots or banoffee sundaes?! Hello - I'm going to make this today - should I use salted on unsalted butter? Hi Sarah, you can use either so its really up to you. We tend to use lightly salted as it brings out the flavour of the ingredients. Hi Mary, good news you can buy our Carnation Caramel - which is toffee in a tin! All you need to do is spread it straight from the tin. You will find the caramel next to the condensed milk in the supermarket. It really is that easy! Hello, a friend studying in the UK has been raving about Banoffee pie. I was wondering if you could recommend anything we have here in the USA similar to digestives? And Carnation Caramel? We do have your condensed milk, but I am desperate to make this pie taste as authentic as possible! thank you! Hi Gloria! Greetings from across the pond! Your friend is right Banoffee Pie is scrumptious but then we are bias! If you use Graham crackers for the base these should be pretty close. 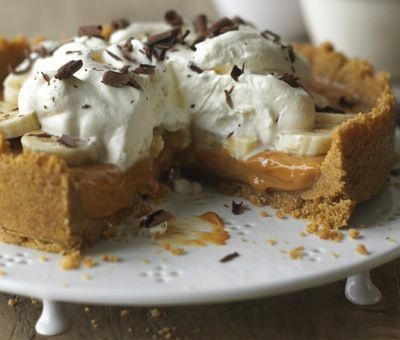 Also you can use condensed milk just follow our classic banoffee pie recipe instead! Easy peasy! Let us know what you think! Hi Hayley, lemon juice should help - mix the sliced bananas with a little squeeze of fresh lemon juice before putting into the pie. Make sure that all the bananas are covrered in cream - but they will still go a little brown even using these tips. Hi, I was wondering if you could use whipped cream instead of whipping cream? I was looking through all the shops around me and i couldn't find any whipping cream so i thought of whipped cream. Hi Sophia, yes you can use ready whipped cream if you like. Whipping cream is normally next to the double and single cream in the supermarket. It has a lovely light texture when whipped and is lower in fat than double cream which you would normally use for whipping. Sooo delicious and couldn't be easier to make! Is it essential to build the base up the sides? Do you think the banoffee filling would hold its shape without? Hi Kirsty, yes you do need to make a pie shell as it holds the filling in better - also you may end up with a very deep base if the biscuits are only used for underneath the pie. Hi Sammi, all biscuits are slightly different - try adding another 25g melted butter to the base and make sure that you chill the whole pie for a bit longer - it might have crumbled as your fridge may not be as cold as it could be? I've been making this banoffee for years now its my special dish! Now it's in the fridge for my aunts 70th !!! This is so easy and sooooo scrumptious!!!! We loved it!!! Robs can you freeze this? Hi Robin, unfortunately fresh banoffee pie just isn't the same once frozen - the bananas tend to blacken and the base can go soft. Have you got some left over (shock horror?!) or do you want to be prepared in advance for something? Made this today and everyone loved it! I said it was quick, and someone said that caramel must have taken some time. I 'fessed up! can we use strawberries instead of bananas? Hi Sally - yes of course you can - Strawboffee Pie sounds delish!!! Hi! This is a great recipe but there is a problem I am not a great fan of bananas so I just wanted to know if I could use a different fruit, for example strawberries, instead of the bananas? Hi Sally - we love a bit of adaptation - so go for it! Strawberries or raspberries would be delicious or perhaps cooked pears or apple would be good. Mmm toffee pears! Yummy! Hi Dawn, we don't recommend that the tins are boiled - best to follow our Classic Banoffee Pie recipe by melting butter and sugar and adding condensed milk to make the toffee... Its scrumptious! Made this today for the first time. Quick, easy and tastes delicious. Personally I would use less cream next time. Hi Amanda, you can buy cartons of whipping cream with the fresh cream in the supermarket. Use a whisk to beat the cream until thick (soft peaks). Alternatively you can use ready whipped cream. Hi Isabella, the good news is you don't have to - look out for our Carnation Caramel which is the perfect ready caramelised banoffee filling! Simply open and spread out into the pie base! Happy cooking! I've been making banoffee pie for years, and use to have to boil the can of condensed milk, it was great when I discovered carnation caramel! I made the banoffee pie but the caramel straight from the tin has not set. It's been in the fridge for 24hrs but still moves around when the tin is tilted. I used two tins of caramel as it's a large pie. Is there anyway I can stiffen it up again? Hi Carol, our Caramel is a soft toffee and its always best to stick to the recipe as 2 cans of caramel is too much and it will be more soft. 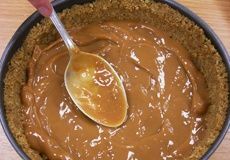 It should be fine in the recommended size base, and another tip - don't beat the caramel as it makes it go very runny, simply spoon into the base. I made this and it was really easy and quite fun to make too! This is so easy to make and to eat! Hi Donna, you don't need to boil the tins any more to make caramel - you can buy a tin of caramel already done! But if you want to keep the ones you've made then it should keep fine for many months - however it may go darker over time. For best results use within 2 months. I have made this twice now it was such a hit! Even members of my family that aren't keen on bananas like this recipe. I it very quick and simple and looks really yummy when completed. Dark chocolate shavings adda bit of bite as the pudding itself it very sweet. Hi Lorna - mmmm chocolatey! Very easy to make my 10 year made for his Dad, wants to make this again a brilliant way to get children interested in cooking. Wewill be looking at your other recipes and trying them. Dad loved it and didn't share! Right now my biscuit base is chillin and so am I. Do I really need to use the WHOLE tin of caramel? Plus I bought a can of squirty cream - looking forward to this!! Hi Jo, yes the whole can - it does make quite a few portions! Squirty cream is ok if serving the pie straight away - but it does loose its shape over time. Freshly whipped cream will last a few days. Hi I've just made the quick Banoffee pie and all seems good. In the recipe under heading along with super speedy caramel you suggest that you also do ready crushed biscuits is this right ? Hi Val, unfortunately we don't sell ready-crushed biscuits, so keep on using your favourite brand to make our delicious Banoffee Pie base! And thanks for making us aware of our misleading heading - we've now changed it to avoid confusing other customers. Quick and esay to make, will definitely use it again. My family loved it. the bannoffee pie i made was FAB and SOOOOO easy to make! A great way to entertain kids on a rainy day! Great with fruit! i love dessert so much. so i like to try this banofee. Fantastic recipe! So easy to make. The caramel is to die for. Went down well in the house. really really easy to make. Love making it. Love eating it!!! This recipe is so easy and hassle free; an instant family pleaser! Been meaning to make one of these for a long time, worth waiting for! delicious very easy, just what my daughter wanted on her return from uni..
Quick Banoffee Pie Recipe is rated 4.6 out of 5 by 21. Rated 5 out of 5 by Nela from Quick and tasty Good recipe but really don't like the idea of being forced to write a review to be able to see the recipe. Rated 5 out of 5 by sonya from So Easy This is one of our absolute family favourites - such an easy recipe, makes an amazing banoffee pie. Top tip - make it the day before, it always tastes better when it has sat for a day. It never sits around for too long in our house. Rated 5 out of 5 by JM28 from Quick banoffee pie I regularly make this pie for my family, it’s a particular favourite of my granddaughter, and so easy to make. JM. West Midlands. Rated 5 out of 5 by andii from So easy and impressive I've made this on so many occasions and still can't believe how easy it is and yet everyone's eyes light up when they see it. It takes less than 30 minutes and its so easy my daughters don't mind helping. The caramel filling is really good fun to spread. The best cheat ever to an impressive home made dessert. Rated 5 out of 5 by Amz8 from Quick banoffee pie This is my go to desert recipe, everyone loves it , perfect every time , so fresh and tasty . Rated 5 out of 5 by Donna from Good one for hands on kids Really quick and easy recipe. Get the kids to join in whisking and chopping etc. Having read about potentially runny caramel, I popped the can in the fridge at the same time as my biscuit base was setting. This produced satisfying dollops of caramel that was easy to spread. For an extra sweet treat for the kids I crushed a few Crunchies for a honeycomb topping. Rated 5 out of 5 by Smith0054 from Just The Best! You have to make this banoffee pie, it is so easy, quick and inexpensive but tastes heavenly.